Here at The Next Web, we’re big fans of iPhoneography, and are always on the look out for new, interesting apps that make the art of taking photos using your iPhone easier, more enjoyable, and gives you a variety of ways to share those photos with others. From the Instagram-inspired filter craze, to interesting frames and easy ways to back up your photos to the cloud, there’s a little bit of something in here for everyone. We’ve seen quite a few apps that let you create montages of photos you’ve taken with your iPhone, choosing from a variety of layouts. None of them are quite as elaborate as the $0.99 app Fuzel. The app comes with 36 preset layouts of varied widths and aspect ratios, many of which we haven’t seen in any other similar apps. In addition to the preset layouts, you can create your own customized layouts using the ‘cut’ feature. 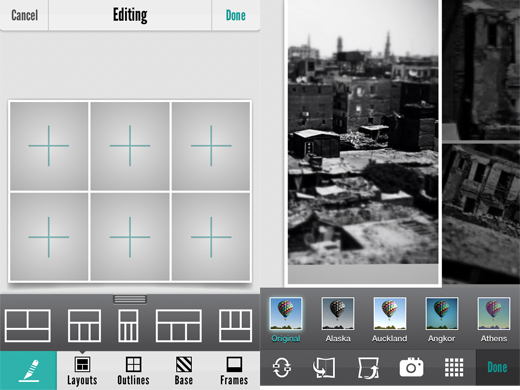 Simply choose the blank layout (or a preset that you want to edit) and swipe the new lines into the grid. Once you’ve got your layout ready, add photos either from your camera roll, or by taking shots on the spot. You can also tweak the thickness and colour of the outlines, and choose from 17 frames to jazz up your collages. It seems that no camera app is complete without filters these days, so it’s not surprising to find that Fuzel comes packed with 18 filters, with the ability to apply them to individual photos. You can also zoom into show only a specific part of each image, and rotate images to boot. Once you’ve got your perfectly framed shot, you can then save a high resolution version to the gallery, or share it via email, Facebook, Twitter or Flickr. Fuzel is impressive on all counts – from its wide variety of features to its easy-to-use and gorgeous UI – so if you’re serious about iPhoneography, this is one app which will help bring a unique and interesting twist to how you display your photos. Fuzel is also running a weekly competition which could win you a $300 iPhoneography kit by sharing your Fuzel creations. For more details, check out the blog post here. Camera Awesome is the latest in free camera apps that make you wonder why Apple didn’t put a little more thought into its own native app. It certainly doesn’t hurt to have a popular photo sharing site like SmugMug behind it, but Camera Awesome has already received rave reviews and snagged the number one spot in the App Store in 34 countries. It is clearly a must-have for any iPhoneography buffs. With CameraAwesome you can shoot photos and video, with several options to choose from when shooting the former. The app has an image stabilization feature, a self-timer, four composition guides to choose from to set up your frame perfectly, and a burst option, to take several shots in rapid succession. 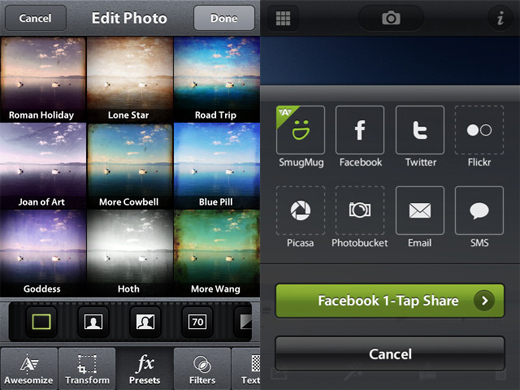 The UI is slick, and doesn’t look like every cookie-cutter clone we’ve seen of popular apps like Camera+. With the filter photography craze, it’s not surprising to find that Camera Awesome comes loaded with a ton of preset filters, textures and frames to enhance your photos, along with a cropping and fine-tuning feature. The first 9 presets, filters and textures are free, after which each set of 9 costs $0.99. That does mean that if you decide to take the plunge and buy all of the available effects, a once-free app will cost you about $29. One of our favourite features when it comes to applying filters on Camera Awesome is the ability to simply swipe the photo to see how it looks with the next filter in line, making it a really easy way to find the perfect filter for your shot. This is however somewhat marred by the $29 price tag that comes with getting the absolute most out of the app. That said, it’s up to you to purchase just the filters that you want to use, and you can check out how they look with your photos, before buying. Once you’ve got your image ready, you can automatically share it directly from the app to Facebook, Twitter, Flickr, Picasa, Photobucket, while videos can be uploaded to YouTube. You can also of course share your photos to your SmugMug account, with an automatic cloud backup feature that comes with the service. We’ve already taken a look at the free app Kicksend, which makes it easier than ever to share multiple photos from your iPhone with friends, but no list of the latest photo apps worth downloading would be complete without it. Anyone who has tried to send multiple photos from their phone to a friend knows the pain of having to line them up one by one, or resort to workarounds using services like Drobox. 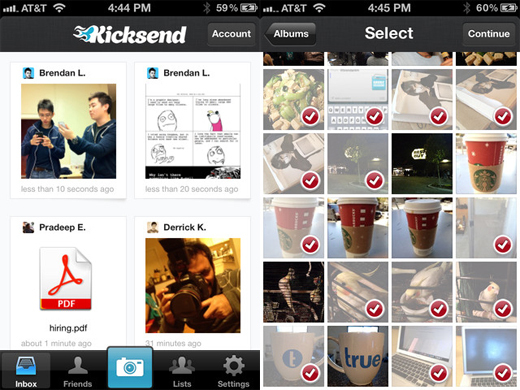 With Kicksend you can send up to 30 photos to your friends at a time, making the process easier than ever. There are a few restrictions that you need to bear in mind. In order to receive your photos, your friends have to sign up for a Kicksend account – but that doesn’t mean they need to have the app as well. Kicksend is accessible via its website, a desktop app (available for Mac and a beta version for Windows), and when we spoke to CEO Pradeep Elankumaran, we were told that an Android version is also in the works. Free accounts get 1GB per month, with paid upgrades available. As we’ve seen with services like Dropbox, you can earn extra bandwidth by performing certain tasks, like downloading the desktop app or getting your friends to sign up for the service. Wish you could tell Siri to take a photo? Now you can. Sort of. 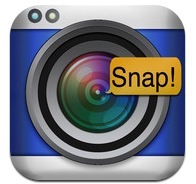 It might be a little gimmicky but oSnap definitely deserves a mention. With the voice-activated app, all you have to do to take a photo is say ‘Shoot’, ‘Cheese’, or ‘Snap’. Not only can you take photos using your voice, you can also switch between the front and rear cameras, by saying ‘Switch’ or ‘Flip’ and turn the flash on and off, by saying ‘Flash on’ and ‘Flash off’. The app does have its quirks – there’s a little button with a mic on it and it doesn’t appear to do anything – at least we couldn’t get it do anything. If Apple hadn’t already introduced the option to take photos using the volume button, this app would have been the perfect solution to the finger acrobatics we used to have to do to reach the camera button. Either way, it’s a fun app to play around with or show off to your friends. Another app we’ve taken an in depth look at before, but definitely deserves a second mention is GroupShot. 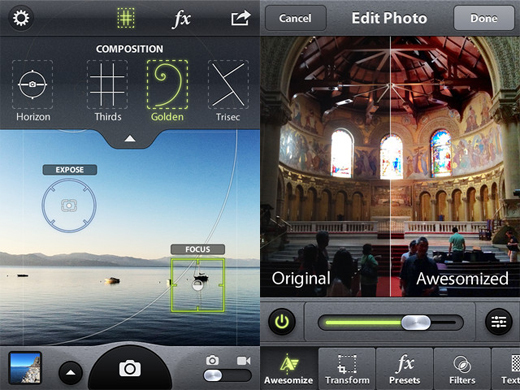 The app is certainly the best we’ve seen when it comes to manipulating your photos to create a little magic. And no we’re not talking about filters or fine-tuning. If you’ve taken several group shots of friends and family, but can’t seem to get them all to smile at the same time, then GroupShot is for you. With the $0.99 app, when you’ve taken several photos, with the swipe of a finger, you can remove objects and switch out people’s faces so that no one is blinking, looking away from the camera, or making a funny face. If you want to get the app for $0.99, best to do so now as the price will eventually be increased to $1.99. While Kicksend makes it easy to send multiple photos to your friends, Pinweel offers a slightly different option when it comes to sharing your iPhone photos with others. 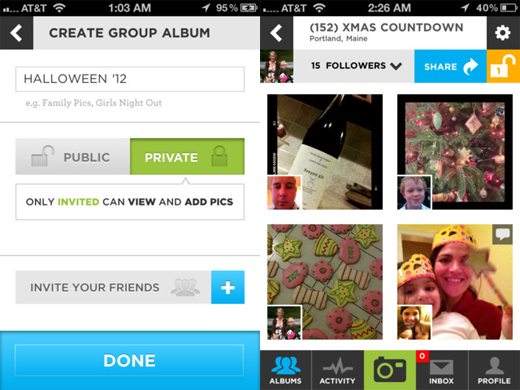 Rather than just send them to individuals, Pinweel allows groups of people to view and contribute to group albums. After signing up for a free account, you can create private or public group albums, and invite your friends to the album, where they can either view, or view and contribute to them. 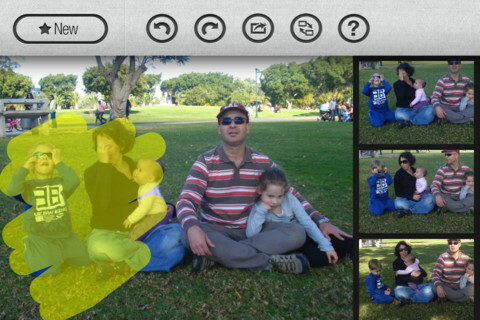 Photos can be added to Pinweel from the camera roll, or you can take a photo through the app itself. And guess what? Pinweel has filters too. Seriously. When uploading photos to Pinweel, they can also be automatically shared with your Facebook friends and Twitter followers if you want. As your friends begin to contribute to the album, you can all comment on the photos, and see who uploaded each one at a glance. Pinweel is a great concept and makes it easier than ever to get all those iPhone photos from one party, concert or event in one place. That said, it’s a shame that it doesn’t support other platforms so that it really takes the group sharing concept to a whole other level. Everpix is a great app which makes it easy to keep your photos in sync over a variety of devices and sites. 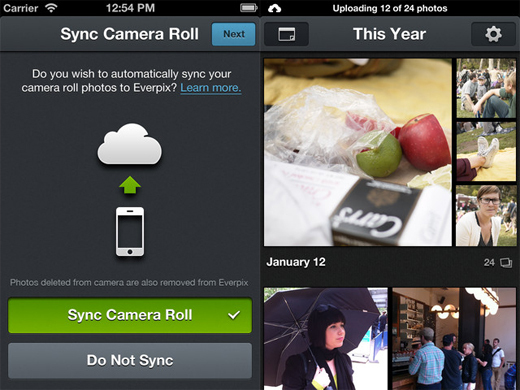 After signing up for a free account, just check the option to sync your camera roll with Everpix, and you’re done. The app keeps the photos on your phone, in the cloud and in the optional desktop Mac perfectly in sync – meaning if a photo is deleted from one place, it disappears from the others as well. Photos are automatically placed in albums sorted by year, and you can easily share any photo from Everpix to Facebook and Twitter. Everpix also provides users with a Mac uploader, and through the Everpix website, you can also automatically import all of the photos from your Facebook, Instagram, Flickr and Picasa accounts, making it the ultimate cloud backup service for all the photos you have scattered over various devices and accounts. If we had one feature request, it would be the ability to disable syncing over 3G on the iPhone app. Everpix is currently in public beta, so the service is completely free. Once it comes out of beta, free and premium subscriptions will be offered. Do you have any great new iPhone photography apps that you’d like to recommend? Let us know about them in the comments. Want more? Read The 30 best photography apps for iPhone.